Using the same value for all the caps makes board assembly a little cheaper, too. Sorry this is turning into a bit of a tangent, but it had me curious, in the interest of truly correcting my mistake. If my tracing out the circuit associated with C34 is correct, then below is what it looks like, and the associated pin (62) is G0. (Click on the image to see it in full size.) And if all of that is true, then according to the diagram from the 5724 data sheet, it should be a 47nF cap at C34? I'm not disputing your confirmation that what was provided from the manufacturer was/is a 100nf cap. Happy to report my make-shift SCART adapter is working great. :edit: N64 is rock solid. GBS-Control does not like a de-jitter modded SNES. :edit edit: @rama - if you have a GBSC associated with a wifi network, how do you revert it to AP mode? :edit x3: Saturn also tested, no problem, looks great! @ rama - here are the outputs from GBSC, while running SNES with a regularly jumpy screen. Unfortunately, I don't know what to do with these update files. They should probably be programmed onto the MTV230 MCU but I have no idea, how. No problem, it's great when people double check! Yes, the recommended capacitor size for coupling the color components is 47nF. All color channels would have to have the same size, so one would have to change 6 of these tiny caps. I assume the 100nF are fine as they are. The color clamping accuracy will be reduced over a 47nF version, but imo it already works well enough. The capacitor size for SOG was mentioned in an Analog Devices datasheet for one of their sync strippers. It seemed to be a low value (33nF or so), so I checked the GBS datasheet. Low and behold, the chip wants just 1nF! At 2 orders of magnitude difference, of course the stock GBS solution would have issues. In the Arduino upload setings, choose "erase sketch and wifi" (or similar wording). Must be the coast settings. I just don't have such a modded console here to test it. You could try some older versions, as I varied that settings over time. I plan to convert all presets to this very high ADC sampling clock (2560), if possible. I've no idea how much "pixel doubling" that would be in a perfect integer solution, but it is a lot of oversampling. The ADCs are maxed out and all line buffers are close to limit. The result can look very sharp. It only seems to depend on the sampling phase now. If it looks a little bit blurry, try a reset. You'll get one out of 4 (or so) different phase positions each reset. One day I'll figure out why this isn't consistent! We're at 0xc1 consecutive good sync samples (Arduino loop() runs), and even the H-PLL is locked sometimes (ah well, still improving :p). Thanks for the infos, rama. I flashed the oldest version I could find on your github - 9/17/18. It acts about the same. I will say that the SNES is the cleanest in appearance. Sadly, it will take a bit of effort to capture VGA, whereas before I was going GBS->OSSC, but my OSSC is out for repair. So, I'm afraid there won't be any good video capture for the time being. But SNES does look really good when it's not jumping. So, if there's anything else I can provide from the jumpy SNES output, let me know. I thought I was running the stock preset. Haven't changed anything that I'm aware of since a reflash, but I did just flash and reset wifi, and it's the same. :edit: and then I found older sketches. Digging into that a bit now. :edit edit: I flashed a release from 08/23/18. It seems more stable, although still a stutter here or there. If there's a particular release you would suggest targetting, let me know. Hmm, better get back to the latest version and try to capture an information mode output when the glitch happens. You need to enable info mode, play a little, be ready to quickly disable info mode when it happens. Within that bunch of status updates will be the glitch, and hopefully a log of what the scaler saw at the time. A very short glitch (sync loss) will shift the usual row of info mode prints, so you can spot where it happened. Since I regularly run 1Chip SNES as well, I know that regular models should work. The problem could be related to the CSync signal conditioning that the dejitter board does. You could try removing the 100Ohm resistor, or changing it to some higher / lower value (75 Ohm / 330 Ohm, for example). Oh, and your configuration file says to default to the 720p preset, by the earlier log. In the web ui, you can select which of the default output resolutions (presets) you prefer. Do you have a 3D printer for trials? Unfortunately no, I do not have a 3d printer for trials, but I guess it would be possible to use a printer service later on when the model is more complete. Thanks for your dedication, especially since it now cost you money! 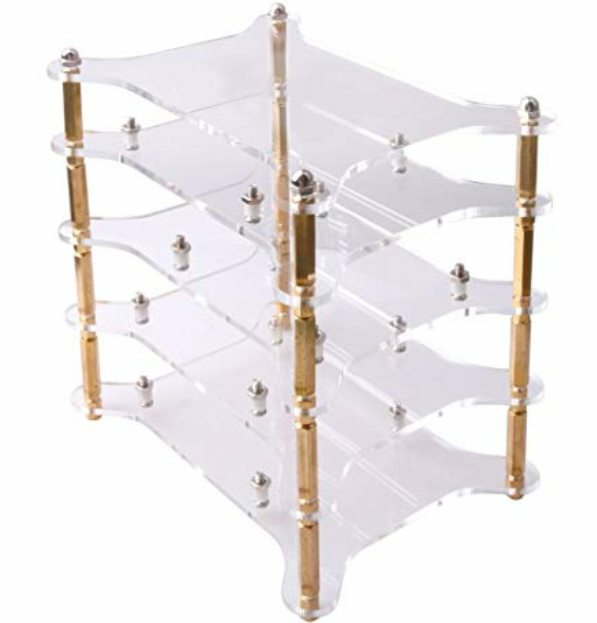 I still wonder if it wouldn't be better to go with 2 simple acrylic plates for top and bottom. This would look good and be far easier to work with (and should be cheaper to make). All these need are 4 bore holes each, and off-the-shelf metal standoffs + screws. Along with being cheap, this solution allows any kind of connector layout by default (:p). 3D printers aren't quite there yet. The situation would be different if everyone had one available. I agree that the acrylic version is a far simpler approach but to me it doesn't cut it when it comes to design. If you ask me it looks terrible although functional. Anyway I will probably make a design and open source the files later on for anyone to use. It will take some time though and don't expect miracles. I think printer services like shapeways can produce pretty good quality results but of course it comes with a price tag. 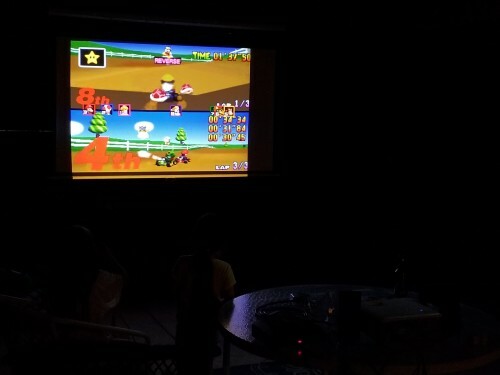 The good news is, the get-together was a success last night, with N64 starring GBS-Control at the center of the action. 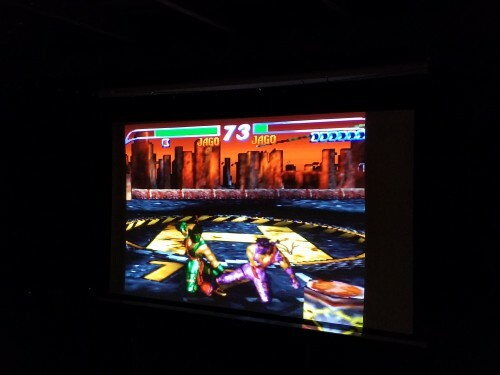 Killer Instinct Gold and Mario Kart 64 were a hit, for young and old alike. 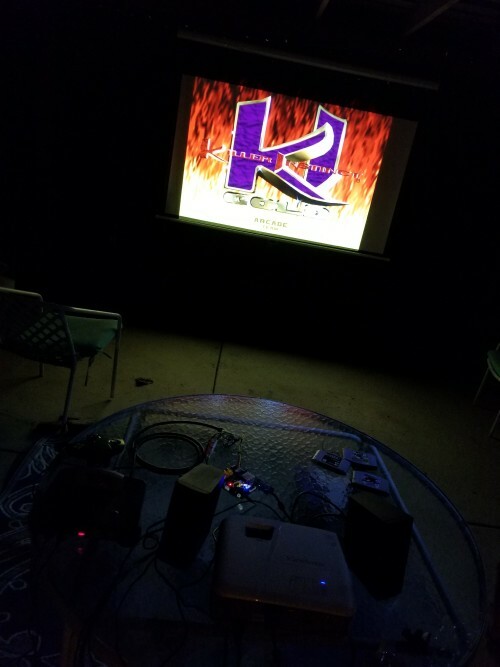 The setup worked great on my buddy's outdoor projector (with VGA input). Okay, so I did print infos. Below is the output. I noticea couple instances of "PLLx", whereas no other lines have that x. Is that possibly the glitch? For what it's worth, I fashioned a HD-15 to RGBHV cable, and tested taking the GBSC output to DVDO VP30. With DVDO VP30 framerate locked at 60hz, the SNES is rock solid via this chain. The hiccups only occur (with limited testing), going VGA output from GBSC directly to a monitor. Awesome that it worked so well! Unfortunately, it just confirms that the scaler is indeed loosing the lock on the signal. I can't tell why it happens, but some parameter must be borderline. It could be the ADC sampling phase, which I just corrected because it could go bad in some cases. Also I just noticed that the H-PLL doesn't lock well to the incoming HSync. This can happen if the SOG circuit samples the signal where it's very jittery, which would be the bottom of the falling edge. If you have your ESP8266 connected via USB, you can use the terminal to instruct it to use another sample position. Send "wsog X", where X should be between 2 and 9 (default is 4). Watch the info prints as you do this. Chances are that the PLL lock counter shoots right up at wsog 5, for example. Over time, I've tried a few solutions to automatically determine a good value but I don't really know by which method I can determine if it's actually good. I ve changed c33 and c35 with 1nf capacitor. 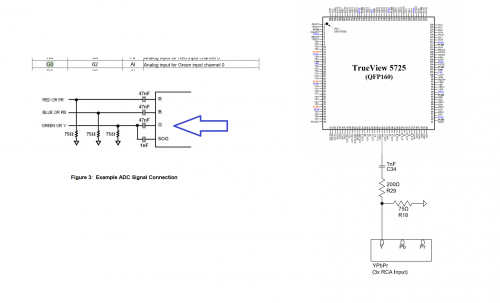 When i connect a console with composite video sync, i have to use the 100ohm resistor between Sync and ground on gbs8200 driven by gbs conbtrol ? And when the console has csync, i have to remove this resistor ? the resistor should be installed for both types of sync. Only when the console has problematic CSync (Mega Drive), it may be better to remove the resistor. I haven't done any testing with VGA direct to a monitor yet. Hope to check into that, within the next couple of days, and give some feedback. Your DVDO seems to like the signal as well. I always notice that you seem to be loosing ADC gain (brightness + contrast, basically) somewhere in your chain. It's easy to boost this in either gbs-control (ADC gain +), or your other equipment (probably contrast and color controls). I saw a minor issue where I know I can still improve things. The Saturn capture is shifted low too much. I think I need to reintroduce the NTSC/PAL serration pulse skipping method. That should allow more consistent default vertical positions. No, it's not your TFT, although I do have a TFT that behaves the same. But yes, the colors are lacking pop. I cranked up the pots on the GBS-82, which offered the most improvement, but they are maxed out. ADC+/- via the web UI doesn't seem to do anything for me. 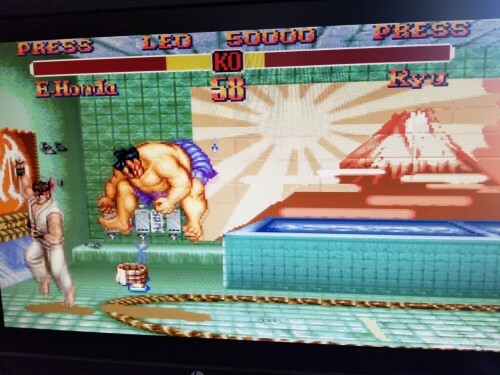 For positioning, I did fiddle with the various ups, downs, HS/VS shifts, etc., to get the image centered and mostly on the screen (completely on screen for Genesis, SNES has some pixels cut off top and bottom, Saturn I think has a few pixels horizontally missing). I set it for Genesis, which took a few minutes. Once that was set, other consoles were just minor tweaks. For a test, you could select auto gain. It should immediately get very bright then. This is part of the auto routine. It dimms back down over time, faster when displaying full white. OKay, will give it another try and the auto gain. the auto gain option is just for testing, so that you can verify that it actually does something (or not). If it works, then you know you just have to hit the gain + button often enough. I'm currently working on 2 additional hardware units: The read and write FIFOs. Deinterlacing is now applied whenever gbs-control thinks it's necessary, ie: When the source is in fact interlaced, not 240p. It required a lot of changes due to the RFF/WFF units and it may affect performance for regular presets a bit. I'll have to do quality and lag tests, and the deinterlacing itself could probably look better (it's very "weavy" atm, but a rock solid still picture). Yeah, Rama is doing really an outstanding job. Although I don't have a GBS and I'm not too interested in scalers, I just keep checking this thread daily to see what he managed to do each time. Wish I'd seen the update about deinterlacing before running some new tests this morning. Off to update my ESP after this post and test some more. So, I believe I owe an apology, rama. It looks like the sync issues may have been entirely on my end. After the most recent revision (downloaded and flashed to ESP by me on 10/26), SNES was still buggy and N64 was completely unstable. I measured voltage at the GBS today, and found my 5V 2.5A power supply was putting out 4.8V under load. I replaced it with a 12V 1A power supply, and everything is rock solid. Some interference and other imperfections also seem to be much improved. I also took your advice on checking brightness and other color settings at the different points in the chain. A minor adjustment at the VP30, and about a 30% adjustment to my capture card's hue, and I think I've got it pretty well dialed in and looking really good. Would appreciate any feedback, to make sure I'm not looking at it through rose-colored glasses. Oh, and I tested auto brightness, and it does work. I'm still not certain gain + and - are working, but frankly it's unimportant at this point. I have things dialed in and am extremely happy with the results. Thank you again for all your hard work! Guess it'll give me time to order some 1nF caps... what's the recommended package size to get? Any other electrical bits & bobs I should track down in advance for the various mods? BTW I have an 8220 v3 that I bought from jammaboards.com which is in some way altered to work with the midway Mortal Kombat boards. Not sure what the deal with that is. Or at least, my original 8200 didn't work with the UMK3 board I have, and this board does. Anyone know the story? Does the CFW handle these boards OK? And if not, is it fairly easy to disable the CFW from loading if desired for particular boards (and do the various hardware mods break the normal functionality of the GBS)? Sorry for the question dump! The power supply thing can happen, more so on 5V units, since the margin is small there. Sometimes the connectors develop a little resistance, and that alone can drop the Vout to be lower than 5V. Your color adjustments immediately strike me as off, even with my bad PC tft. One general rule when adjusting is to never touch the hue settings. Those should stay at their default. You can use controls sometimes called "color", "contrast" and "brightness" on your other gear. But the initial problem looks to be just a too low ADC gain on the GBS, probably because the pots are still installed (and that most retro systems generate less than nominal 0.7Vpp). Check the serial output on the bottom of the page. I guess a good value for your system would be "ADC gain++ : 68" or so. Each system will have their own best values. Auto gain takes a long time but it will adjust the gain automatically, if you wait long enough (It needs to see full brightness inputs, a white screen is best). Last edited by rama on Sun Oct 28, 2018 10:14 pm, edited 1 time in total.